This week I have been talking to women who deeply desire their husbands to step into the role of Spiritual leader in their home. Even though they are Christian men, they don't seem ready or comfortable to be this leader. How can we lead our children? Maybe you are a father and are not sure how to lead your home. 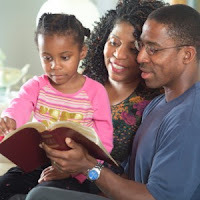 Friends, how we lead our family Spiritually is a huge part of the legacy we are leaving our children. Make your own quiet time just you and God a priority. When we are living for Christ and spending time with Him two things happen. One, our family will see that example. Two, we are bringing the Spirit of God into our home. Make meal prayer times a must. Thank God for the food He has provided for your family. Have a time of family devotions. There are some great books out there for family devotions but don't rush right out and buy a bunch of books. Just spend time in God's Word! The book of Proverbs is a great place to start. It has 31 chapters and most months have 31 days. With the family, read a chapter a day then talk about it. If your kids are little, you likely have a preschool storybook Bible, if not you can pick them up fairly cheap at Walmart. Read a Bible story each day then talk about it. Be sure to pray with the kids too. Don't think your time has to be hours on end. Start out with fifteen minutes. Play worship music in the house and car. Sing along and encourage the kids to sing along. When the kids start acting up that is a teaching time! Talk about how God can help us control our feelings and pray about it. If someone gets hurt, bandage and care for it if need be, but never forget to pray over it. When something good happens, be sure to praise God for it and let the kids know that God has blessed you. When you are in a bad mood, ask your spouse or even child to pray with you that you will have the joy of the Lord. Be careful what you watch on tv and the websites you visit on the computer. Always think integrity! Never push him! The more you push and nag, the less he will want to lead. Pray over him. Pray that God will give him a boldness in his faith and the courage to take a stand for his family. When it is prayer time or Bible reading time, ask him quietly if he would like to say the prayer or do the reading. If he says no, do not be upset or disappointed. Just say "okay, maybe another time" and leave it at that. When you are feeling sick, upset or discouraged, grab his hand and ask if he would please say a prayer for you. If he is shy about praying out loud, just ask him to pray for you when he says his prayers. When the kids have an issue and come to you for guidance and prayer, say "let's go to dad and ask him to join us for prayer." Even if he doesn't pray, his presence is important. Though we want our husband to lead us, we can still lead him by example. Pray and read the Word. Talk to your husband about what you have been reading in the Bible and about what God is speaking to you. Open that line of communication. One of my favorite movies is Courageous. Have a family movie night and watch the movie, then in private, ask your husband if he has any ideas that you can do as a couple to lead your family toward God. It is very important to lead our family closer to God. If we don't then the world can lead them closer to Satan. Be sure to join Mandy each Friday at Woman to Woman Ministries as she goes through Resolution for Women, the book from the movie Courageous. Great points, Jenifer. I love that some of my son's favorite songs and ones he loves to sing are worship songs he first heard on the radio while riding along in the car! Hi Jenifer - I love this post. So full of good advice. I LOVE this! Thankfully my husband is DEFINITELY the spiritual leader in our home. I don't quite know how we'd operate if he wasn't. :) Hopping from Reflections of His Grace. I am now a 'senior' with grown children who have grown children of their own. I still strive to set an example by living close to God. Great tips Jenifer! We are living example of Christ to our children and our husbands. Blessings! Great advice on so many things. Displaying our relationship with the Lord in front of our children is so important. It teaches them how to draw near to the presence of God at a young age so it becomes a habit. Thank you for linking up friend! Eileen, isn't it great when our kids start worshiping to songs played on Christian radio!? Mindy, that is awesome that your husband has embraced that role!! Mary, we should never stop leading by example. It is great that you do with your children and grandchildren grown! Kathleen, thank you for your kind words and for sharing!! Shari, exactly! We need to model that example until it is a habit and desire to everyone in the family!